This Gluten Free Vegetarian Pizza Quinoa Casserole is the tastiest, easiest, healthiest family dinner recipe to lure your kiddos into eating their veg! It’s back to work and school time which means I’m all about one-pan and one-pot meals. I grew up eating casseroles because my mom, like most working parents, couldn’t be bothered cooking everything separately. Now that I’m a busy adult with my own business, I don’t blame her. I know casseroles kind of have a bad reputation, as if they’re stuck in the 1950s and boring AF, but my Gluten Free Vegetarian Pizza Quinoa Casserole is da bomb dot com. 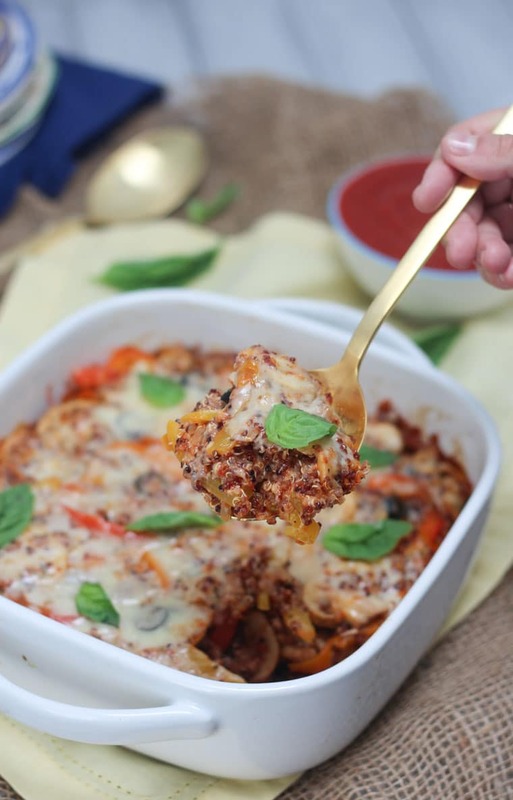 This month I decided to team up with my girls, Wendy and Jess, at Food Heaven Made Easy to bring you an amazing casserole you and your family is sure to love. 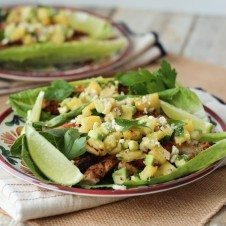 If you’re not familiar with their blog yet, these girls are fellow dietitians that make some DAMN GOOD vegetarian meals. Honestly, their Roasted Garlic Beet Hummus is a favourite in my home. 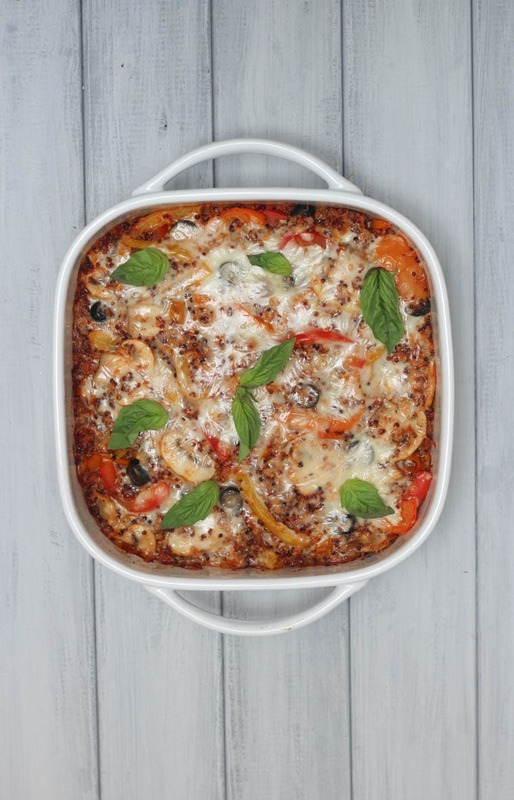 So I thought their readers would enjoy this Gluten Free Vegetarian Pizza Quinoa Casserole too, and all of you would love their Mediterranean Vegetarian Mini Casseroles. Check out this beauty of a dish!! Alright lovelies, let’s make a casserole! This is such an easy recipe and you can basically just make it using whatever goodies you’ve already got in your fridge. 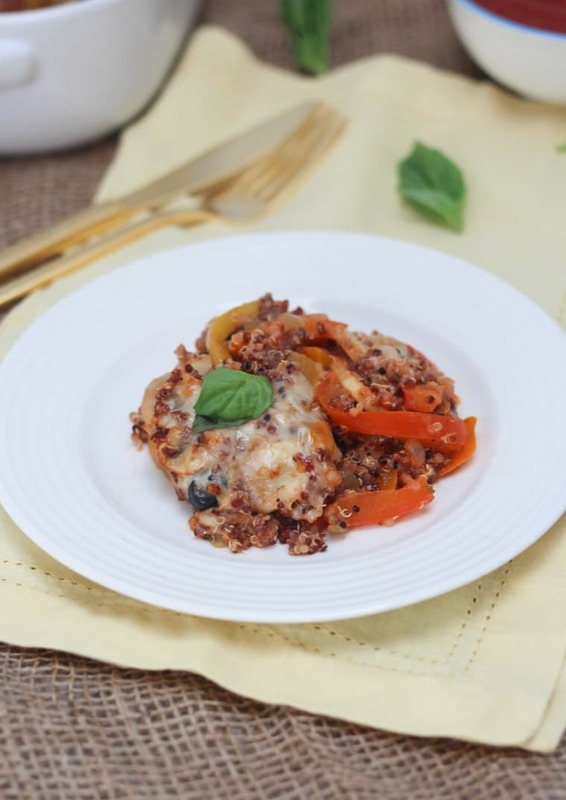 If you and your kids like the flavours in pizza you’re going to LOVE Pizza Quinoa Casserole. Basically, I just cook off some of the usual pizza suspects – bell peppers, onion, garlic, mushrooms, olives, you get the picture. Mix it with some tomato pasta sauce, cooked quinoa, and of course, cheese! Bake that bad boy in the oven until bubbling and BAM, you’re loving life. 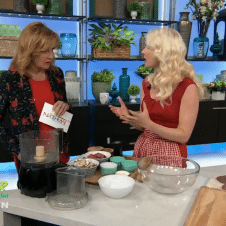 If you’re vegan, you can easily use vegan cheese, and if you’re not vegetarian, you can throw some pepperoni, chicken or sausage into the mix. You take all of your favourite pizza dreams and turn them into a Gluten Free Vegetarian Pizza Quinoa Casserole reality! It’s a beautiful thing. Now I want to know, what are your favourite pizza toppings? 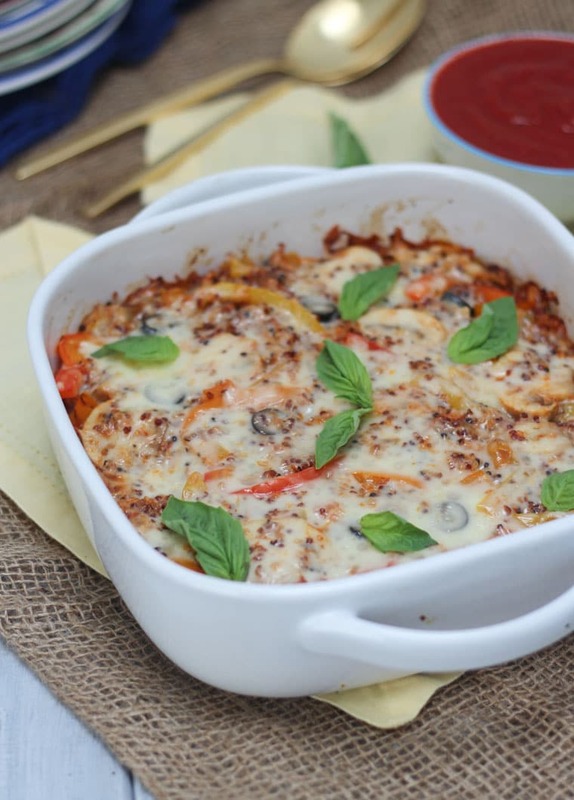 Have you tried making this Gluten Free Vegetarian Pizza Quinoa Casserole? What would you want to try putting into your casserole? 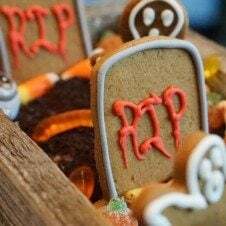 Leave me a comment below and definitely don’t forget to check out Wendy and Jess over at Food Heaven Made Easy! Preheat oven to 375 F and lightly grease a 9 inch square dish. Heat a large nonstick skillet over medium high heat and add in the olive oil. Add the onion and cook for 3-4 minutes until softened, then add in the garlic and oregano. Saute for 30 seconds. Add in the bell peppers and mushrooms and cook until softened and lightly browned. 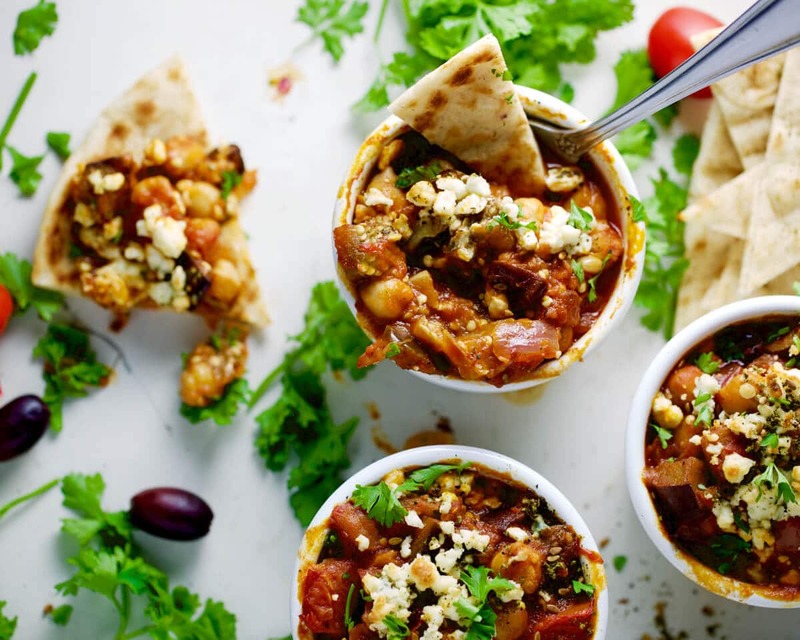 Transfer the cooked vegetables to a large bowl and add in the olives, quinoa, sauce, 1 cup of mozzarella, parmesan and salt and pepper, to taste. Pack into the baking dish and top with the remaining 1/2 cup mozzarella cheese. Bake for 20-25 minutes until golden brown around the edges and bubbling. Top with basil leaves, if desired, as garnish. COULD YOU MAKE THIS CASSEROLE AND FREEZE TO BAKE LATER ? What a great way to do pizza a different way. I could totally switch out the cheese for some non-dairy cheese. Will have to try this out! What a great idea! I’m sure my two girls would love this! Totally! What kids don’t like pizza! I love creative ways to make and devour quinoa. I’ll have to make this, I think it would be a hit with my kids, too! You had me at pizza! 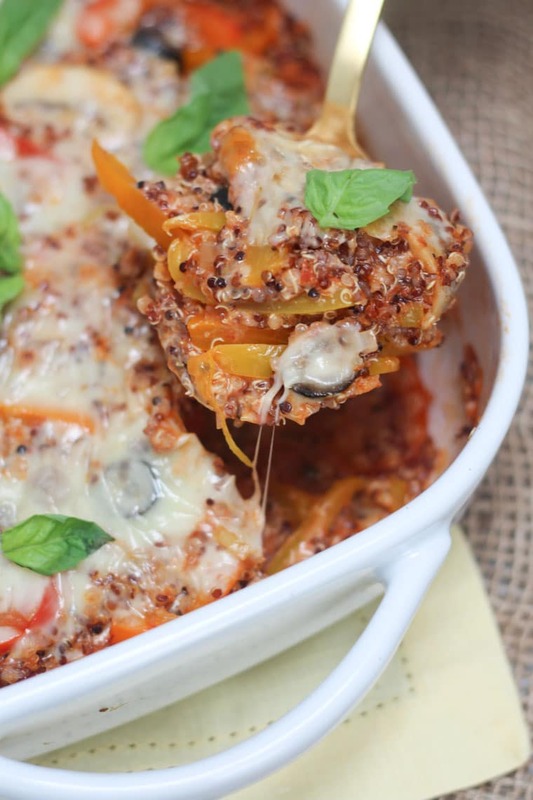 😉 This looks amazing and I love the combo of casserole, quinoa, and pizza flavors. YUM. All the best things in one! Can’t go wrong! Thanks Chrissy! Oooo, so many great ingredients in one dish. Looks like a definite crowd pleaser! right up my alley I would love this for dinner!